About 300-800 species, depending on classification. Temperate and arctic regions, montane elsewhere. 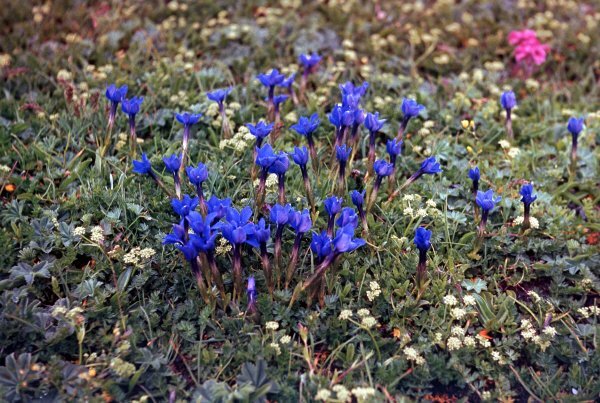 About 65 species in the FSU, including Gentianella, and about 40 species of Gentiana s. str. There are representatives of different sections: 7 species belong to the section Cruciata, 4 to the section Frigida, 2 to the section Gentiana, 2 to the section Megalanthe. Some species have long been in cultivation, e.g. G. lutea L. and G. punctata L. (because of their medicinal properties), G. asclepiadea L., G. clusii Perr. et Song., G. cruciata L., G. dahurica Fisch., G. decumbens L. f., G. lagodechiana (Kusn.) Grossh. and G. septemfida Pall. Some species have been investigated and recommended as prospective garden plants, among them those described below. Siberia (southern Altay and Dzungaria). Stems numerous, erect, leafy, 50 cm. Lower leaves scale-like, upper leaves oblong-ovate, 5 cm long. Flowers in dense terminal clusters, campanulate, dark blue, interior green-spotted. V - mid-spring to late autumn. Fl - late summer (August in the wild). Can grow in sunny and partially shaded sites, requires a moist soil. P - by seed. Z 5 (4). New. G. owerinii (Kusn.) Grossh. (sect. Pneumonanthe). Dagestan. Flowers in dense terminal, 4-8-flowered clusters, bright blue-violet. V - mid spring to late autumn. Fl - July. Fr - October, not every year. G. paradoxa Albov (sect. Pneumonanthe). Southwestern Caucasus. Flowers solitary, yellow-blue, almost brown. V - mid spring to late autumn. Fl - August- September. Fr - October. Both species can be propagated by seed. They require a humus-rich soil, and partial shade. Z 5.